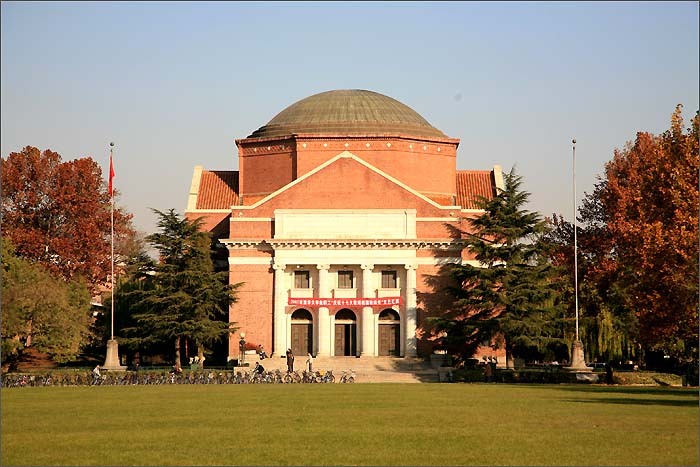 The picture on the top is not Foellinger Auditorium at the University of Illinois, Urbana Champaign, but the Grand Auditorium at Tsinghua University, one of the top universities in Beijing, China. It was said that the Grand Auditorium was built as a replica of Foellinger Auditorium. 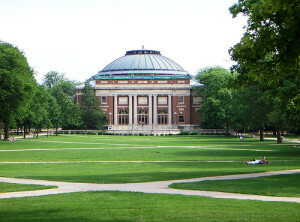 In 2006, when the President of Tsinghua University Gu Binglin paid a visit to the campus, ex-Chancellor Richard Herman greeted her and told her, “The Tsinghua campus was designed by T. Chuang, a 1914 graduate of Urbana’s renowned School of Architecture, who modeled his design on our Quadrangle.” Who is T. Chuang? 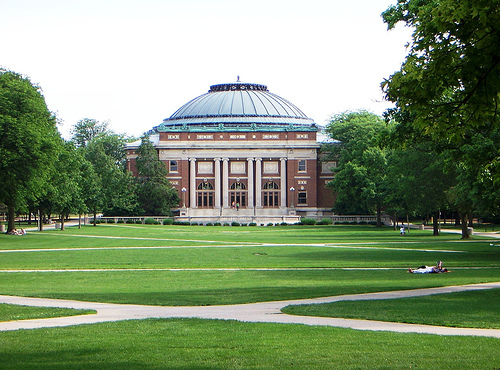 Why would a Chinese student come to study Architectural Engineering in U of I? In fulfilling the Boxer Protocol, which was settled after the Disturbances of 1900, after China’s defeat in the intervention to put down the Boxer Rebellion, the Qing Government in China had to pay an indemnity of 450 million taels of silver (approximately equal to $6 billion today) over 39 years to the eight countries that had provided military forces (Austria-Hungary, France, Germany, Italy, Japan, Russia, the United Kingdom and the United States), plus Belgium, Spain and the Netherlands. About 7.32% of this was paid to the United States. In 1908, the U.S., in a “seemingly magnanimous but also politically expedient gesture” (Building in China: Henry K. Murphy’s “Adaptive Architecture,” 1914-1935, by Jeffery W. Cody, Ph.D.), remitted the unpaid remainder of the indemnity and decided to set up a fund for Chinese students to study abroad with the money. In October, 1909, 47 of 630 applicants were sent abroad, including Chuang. 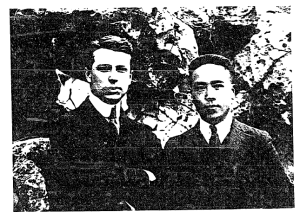 They were the first group of Chinese international students in the States, and Chuang was the first Chinese student at the U of I.
Tsin Chuang was one of only 24 students graduated from Agricultural Engineering in 1914. After his graduation, he worked in the office of Mr. J. W. Royer, the famous architect who was responsible for several buildings, including the Urbana Free Library. His job on this side of the ocean didn’t last long. Part of the indemnity was assigned to the construction of Tsinghua University, but there weren’t any Chinese modern architects on the mainland of China. The authorities sought students overseas, and Chuang was a great choice at that time. It is intriguing that his studies and career were both deeply associated with the fund the U.S. set up. He returned to China in 1914, and worked as a consulting architect at the Ministry of Foreign Affairs and a resident architect in Tsinghua University. When Henry Murphy, the famous American architect who had designed many Western buildings in China for Chiang Kai-shek, was invited for the first time to design Tsinghua University in Beijing, Chuang helped design the campus as an assistant superintendent. The question of style remained an issue in designing the campus. They intended to utilize the existing Tsinghua Garden, which was “reminiscent of traditional Chinese gardens.” However, there were also several non-Chinese style buildings on campus, and more importantly, Murphy suggested, “[t]he Chinese style, if at all well carried out, imposes many restrictions and limitations, from the utilitarian point of view, on the design of buildings intended for classroom and dormitory purposes.” In trying to “compromise the merits of Chinese and Western architectures,” the architects wound up building a purely Chinese-style entrance gate and several Western buildings, including the Grand Auditorium. “Western architecture” is Jeffersonian architecture, a typical style of American villa of the time influenced by European, especially Italian, architecture. Jeffersonian architecture was created by Thomas Jefferson, American president and a self-taught architect, who also designed the Rotunda, the symbol of University of Virginia. 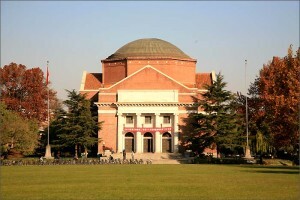 The Grand Auditorium at Tsinghua University has some of the same characteristics as the Rotunda. Still, many similarities between the auditorium at U of I and the one in Tsinghua might be partially influenced by Chuang’s thoughts of his alma mater. During the construction from September, 1917 to March, 1920, Chuang and Charles Lane, the superintendent of construction, “tendered bids from foreign and Chinese contracting companies, shopped for supplies of foreign hardware, bargained for building materials, and oversaw the simultaneous construction of four buildings on the site.” When Murphy turned back to China in May, 1918, he described the work as “thrillingly satisfactory”. In 1923, Chuang was sent to Columbia University by Tsinghua University, leading a hundred or so Chinese students. After he returned to China, he quit his job at Tsinghua University and started his own architecture office in Shanghai in 1924. He continued his career as an architect and was still admired and respected in his 90s. Tsin Chuang passed away on April 25, 1990. As a U of I alum, he should be remembered, since he brought modern architecture to China.